In March 2019, Journey Through the Human Brain, a multifaceted installation designed to put the marvels and mysteries of the brain at visitors' fingertips, opened at the South Florida Science Center and Aquarium, and Ideum was proud to play a key role in its creation. Our Creative Services and Media Systems teams spent more than a year designing, developing, and installing two of the exhibition's most immersive and technically sophisticated experiences. One of these keystone exhibits, Deep Dive Into the Brain, puts visitors in command of an awe-inspiring journey into the brain's inner structures. Reminiscent of the classic 1960s film Fantastic Voyage, Deep Dive starts outside the brain and moves into more and more intricate structures, finally finishing at the microscopic level of neurotransmitters, the complex chemicals that form the foundation of neural communication. The voyage plays out on a massive curved wall at one end of the exhibition. A bright, high-resolution Barco 4K UHD projector casts dynamic 3D images of the brain—its lobes and fissures, inner structures and systems, individual neurons and synapses—onto the 14-foot wall. Guests control their journey at a custom console containing a 43" Ideum Inline display and a joystick with LEDs embedded in an adjacent glass panel. At each stop inside the brain, visitors can use the joystick to select key structures and learn more about them on the console display. 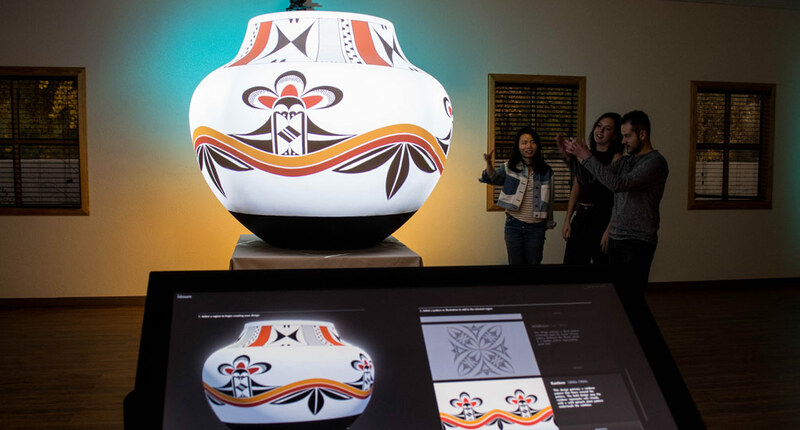 The exhibit's size and detail makes it possible for large groups to view the projected imagery together, and the integrated high-fidelity audio system pulls users across the gallery into the inner-space journey. The projected 3D images were created by project partner Intervoke, a Colorado firm dedicated to working with medical professionals to produce the highest-quality anatomical images available. Ideum built the control application, integrated it with the large-scale projection and audio system, and designed the custom console. Ideum's Brain Development Wall anchors the other end of the exhibition. Like Deep Dive, this experience was designed for multiple simultaneous users. This multitouch video wall highlights the way the brain grows and changes throughout life, from its beginnings as a simple cluster of cells through its rapid development during childhood and adolescence and its maturation as we age. At each stage of life, guests can select from a wide range of floating content windows to view images and watch videos illustrating key developmental processes and visualization techniques. They can also pull a separate window across the entire width of the connected displays to watch a detailed image of the brain as it grows. The exhibit consists of 6 55" LG screens mounted next to each other in portrait orientation, creating a continuous 14-foot 8K video wall. An infrared bezel system encasing the display array makes the full set of monitors touch-sensitive. 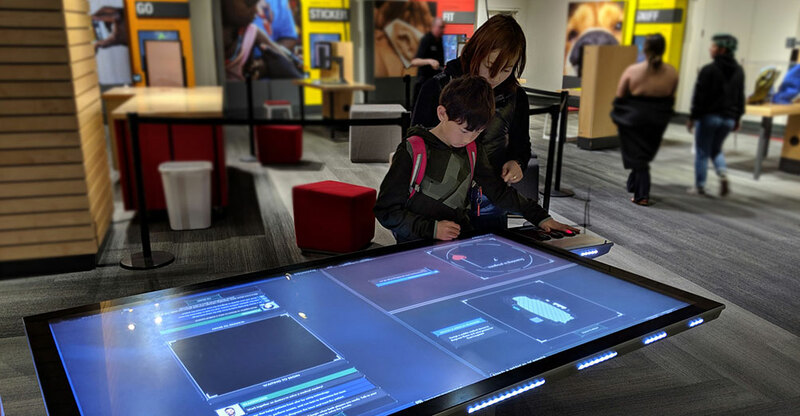 After months of conceptual design, content research, prototyping and programming, and user testing, a team of senior Ideum technicians installed and tested both exhibits at the Science Center. These two innovative experiences mark key milestones in Ideum's ongoing development of ever-more immersive and engaging experiences that combine and integrate powerful technologies, including multitouch displays, video walls, projection mapping, and custom exhibit fabrication. We are very proud to have the opportunity to work with SFSCA and Intervoke to create the next generation of educational experiences.